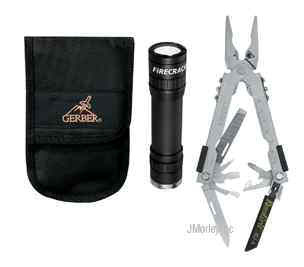 Description: Perfect for Do-It-Yourselfers, the Multi-Plier 600 maintenance kit pairs a needlenose Multi-Plier 600 stainless multi-tool with carbide insert cutters and a premium replaceable RemGrit® blade with our Firecracker™ flashlight. The Firecracker is a rugged light that will give you seven hours of run time when powered by a single AA battery and a longer distance beam and increased spot brightness versus other lights in its class. MSRP $115.54. Components: Needlenose pliers, wire cutter, wire crimper, fine edge knife, serrated knife, cross point screwdriver, small, medium and large flat blade screwdrivers, lanyard ring, can opener, bottle opener, file, and ruler with Firecracker L.E.D.